The list of supporters for the planned New International Trade Crossing in Detroit reads like a roll call of distinguished Michigan stakeholders. Five governors. Five automakers. Twenty-three chambers of commerce. The state’s largest newspapers, corporations and most influential movers and shakers all have signed on in agreement that the state needs a new, modern link between the United States and Canada. Why, then, did more than 477,000 residents sign petitions for a ballot proposal that would put its construction up for a popular vote? Because the organization that stands to lose the most from the new bridge’s construction – the Detroit International Bridge Co. of Manuel Moroun and family, which wholly owns the 82-year-old Ambassador Bridge – has mounted a furious battle to preserve its own stake, bankrolling a campaign it calls “The People Should Decide” and represented by Proposal 6 on the November ballot. Proposal 6 would require all new international bridges and tunnels built in the state to be pre-approved by voters statewide and in the individual municipalities where they would be erected. Further, it defines “new” retroactively, to those not open for business on Jan. 1, 2012, potentially undoing the international agreement for the new bridge signed by Gov. Rick Snyder and Canadian Prime Minister Stephen Harper in June. In that agreement, the Canadian government agrees to carry Michigan’s $550 million share of the costs. While much has been made by opponents of the bridge’s $2.2 billion price tag, the NITC project is small potatoes compared to other major public works now under way. California has embarked on a high-speed rail project with an estimated cost nearing $70 billion; New York City is spending $6 billion to drill a new tunnel to bring water to the city. Proposal 6 also would treat international crossings differently than other public bridges in Michigan, which number more than 10,000, according to a calculation by the Michigan Department of Transportation. “If it passes, people would realize very quickly that the unintended consequences are way more than they bargained for,” said Brad Williams, vice president for government relations for the Detroit Regional Chamber of Commerce, who added that he didn’t think it would necessarily stop the NITC from being built, even with its retroactive clause. “(The crossing agreement between the U.S. and Canada) is a contract, and you can’t break a contract with an election,” he said. At an October news conference to announce the findings of an analysis commissioned and paid for by The People Should Decide, financial consultant Patrick O’Keefe said his company had found that the NITC project was unnecessary, not economically feasible and would end up costing the state $325 million in lost revenue from existing border crossings, including the Ambassador and Blue Water bridges and the Detroit-Windsor tunnel, as well as other costs involved with maintenance of stateside infrastructure. * B & M Bridge between Brownsville, Texas and Matamoros, Mexico, owned by the B&M Bridge Co.
*Progreso International Bridge between Weslaco, Texas and Nuevo Progreso, Mexico, owned by the B&P Bridge Co.
* Los Ebanos Ferry, a hand-operated ferry crossing between Los Ebanos, Texas and Gustavo Díaz Ordaz, Mexico, owned by the Reyna family. * Río Grande City-Camargo International Bridge between Rio Grande City, Texas and Camargo, Mexico, owned by the Starr-Camargo Bridge Co. In Minnesota, the Fort Frances-International Falls International Bridge crosses the Rainy River and is owned by Boise Cascade LLC and Abitibi Consolidated, Inc., two paper companies. “The NITC is being built prematurely in advance of demand,” O’Keefe said. Proponents say building demand is the whole point of the NITC. “If Michigan is going to be competitive going forward, we need a bridge that moves at the speed of the global economy, and that means an expressway-to-expressway connection,” said Mike Johnston, vice president of government affairs for the Michigan Manufacturers Association. One of the criticisms of the Ambassador Bridge is that it doesn’t connect to Ontario’s 401 highway, and trucks arriving in Canada must go through more than a dozen stoplights to get there. The NITC would connect to I-75 on the U.S. side, and to the 401 across the river. The Center for Automotive Research, in an analysis of the new bridge’s potential impact released in June, estimated the project will create thousands of jobs, both short- and long-term, in construction and new private investment. As many as 6,800 permanent jobs could be created, the report said, increasing Michigan’s gross state product by $630 million per year, with personal income and related revenues rising accordingly. Figures kept by the Public Border Operators Association, which gathers data on truck and tunnel crossings between the U.S. and Canada, show traffic has been slowly rising on the Ambassador Bridge since it hit a trough in 2009. PBOA President Robert Horr said traffic is not only dependent on general economic health, but in differences in the exchange rate between the Canadian and U.S. dollar. The two currencies have been almost at par in recent years, which tends to flatten out traffic. The other side has its own set of numbers. Many of them were laid out by O’Keefe at the October news conference. They point out to reduced crossing traffic since the start of the recession and estimated cost overruns at the NITC to be at least 10 percent, which they claim puts the Canadian “unrecovered investment” at $8 billion, based on the bridge’s announced $2.1 billion cost. In December 2011, Bridge Magazine looked at the business case for a second Detroit-Windsor span. “If freight traffic crossing the Ambassador is lower, and there’s no reliable data on the cost of delays, why is a new bridge (with a price tag of $2.2 billion for the proposed public bridge and $500 million for the Moroun bridge) needed?,” the report asked. Proponents’ answers centered mainly around two ideas: redundancy and capacity. The more of both, the more likely Michigan was to benefit, they argued then – and still argue now. But if Proposal 6 passes, don’t expect a vote on the NITC anytime soon. Tom Shields, spokesman for Taxpayers Against Monopolies, an anti-Prop 6 group, says the most likely immediate effect will be more litigation from the Moroun family, as they seek to stop the NITC. If Prop 6 fails, Shields said, construction won’t begin immediately. That process depends on the issuance of a presidential permit from the U.S. Department of State, and the public-comment period for that only ended recently. WHAT VOTERS WILL DECIDE: If you vote for Proposal 6, it is effectively a vote to stop – or at least delay - the New International Trade Crossing bridge between Detroit and Windsor. If the measure passes, additional elections may decide whether the project proceeds. If you vote against Proposal 6, effectively you are supporting the New International Trade Crossing and existing state policy on the construction of bridges, international or otherwise. WHAT THE ADS SAY: Proponents of Proposal 6 have used ads to argue that the NITC is not economically viable; that politicians are untrustworthy; that the bridge will cost far more than anticipated; that, somehow, Michigan taxpayers will pay for it. Opponents of Proposal 6 have used ads to argue the bridge is a vital economic link; that Canada will bear the cost of the bridge; that the backers of Proposal 6 are motivated by thei personal financial interests. WHAT THE TRUTH SQUAD SAYS: Reports by the Michigan Truth Squad have found that ads favoring Proposal 6 were inaccurate and misleading. A flurry of fouls, from flagrant to technical to regular, have been called on the pro-Prop 6 side. The pro-Prop 6 campaign appears to be the least accurate ad series in the short history of the Truth Squad. The Truth Squad found that ads opposing Proposal 6 were mostly fair, though warnings were issued on definitive statements about the life expectancy of the Ambassador Bridge and about the nature of international trade traffic. If redundancy is a reason for DRIC, that has been blown out of the water with the "reverse customs" proposal just announced at the Peace Bridge. That should minimize security issues without spending billions. As for capacity, traffic is down 40% since its peak with nothing to suggest rapid growth that necessitates a new multi-billion dollar bridge. With the new technology being put into place at the border, US Customs can clear a truck in 30 seconds rather than the 2 minutes it took before. Effectively, capacity has quadrupled with little cost. That would be true Joe, if there were actually room on the Windsor side of the bridge to implement reverse customs, which, of course, there isn't. There isn't even enough room for normal customs operations, which was one of the considerations that led to the recommendation for a new bridge further downriver. Quote from the opening papagraph: "The list of supporters for the planned New International Trade Crossing in Detroit reads like a roll call of distinguished Michigan stakeholders. Five governors. Five automakers. Twenty-three chambers of commerce. The state’s largest newspapers, corporations and most influential movers and shakers all have signed on in agreement that the state needs a new, modern link between the United States and Canada." WHERE ARE THEY? I have not heard one single word on TV, on the radio, in the newspapers, or any magazine from any one of these so called supporters of the NITC contesting Moroun's claims. But I have heard plenty from Matty Moroun and so have the rest of Michigan voters. The citizens of Detroit and Michigan are fed up with the political "leadership" in this state and Moroun, by equating the NITC with this same political "ledership", offers them a means to express their dissatisfaction. My prediction: No contest! While the so called supporters of the NITC smugly and silently sit on their butts, Matty Moroun will win hands down and Michigan will take another step backward toward national irrelevance. To Joe Blog, three things to consider, 1) 2 bomb scares in recent weeks, 2) Port of Halifax continues to import and export more each year which relates directly to truck traffic on the bridge, 3) talk to a real trucker 2-4 hour waits are average. No company or individual should own an international crossing. How many more phone calls does it take to create a bomb scare at another bridge? You can subscribe via RSS feed to the delays at the border, would love to see the data backing up your claim. Customs is the issue, not capacity. Actually Carl, the bigger issue is congestion along the 10 miles of commercial/residentail corridor that currently connects the AMbassador Bridge to the Canadian equivelent of an interstate. Widening this road all the way to the bridge wold be significantly more costly that building the new bridge and a freeway connecting link to the proposed NITC location. Conveniently for the bridge company, their plaza cams don't capture any of the congestion that happens daily on this corridor. JoeBlog is a Canadian Moroun supporter. He's been doing this for years-and may well be paid for his biased opinion. I'd pay no attention to his statements. The never-ending arguments about 'traffic is down' can be easily solved with government border crossing statistics.This website, http://www.bts.gov/programs/international/transborder/TBDR_BC/TBDR_BCQ.html allows you to query border crossing data for the major border points. Overall border crossings at Detroit ARE down-but truck crossings have revived considerably. On the query form, select Michigan as location, 'all years summary', 'annual summary', 'Detroit' as port and 'trucks' as the measure. From the summary it is easy to see that truck traffic is down somewhat due to the recession but has been approaching it's former higher levels. Personal vehicles selected will show a 3 million loss of traffic-not trucks. And trucks are the real need for another bridge here-because cars can and do take the tunnel. You can use the form to select for figures across northern border crossings, too-and those figures will show that Detroit handles the vast majority of northern border international freight.. Then check the southern border crossing data for Laredo, TX-one of our largest southern entry points. The correlation is unmistakeable-and Laredo has FIVE international bridges, including the newest, trucks-only 8-lane World Trade Bridge.. Dont be side-tracked by phony figures . . do your own research. It only takes a few minutes using this website. Linda, That BTS website only tracks traffic entering the US, not two-way traffic. And it also only records traffic according to the Customs Port of Entry. So you can't differentiate the traffic on the Peace Bridge from the Lewiston-Queenston Bridge because they are both included in the Buffalo Port of Entry. The Public Broder Operator's Association (http://publicborderoperators.org/ ) does track two-way traffic, but only at border crossings along the St. Lawrence Seaway where there are bridges or tunnels. But they do not include crossings west of Sault Ste. Marie, or any of the border crossings east of Massena, New York. The importance of the bridge in freeing SE Michigan from a monopoly and the potential for the auto industry to continue to operate across the boarder with Canada make the new bridge a very easy decision. This effort by a person who has shown nothing but the basist motives in paying legislators for their vote in 2010 should be rejected. Are we confident that he is maintaining his 80 year old monopoly bridge. Just look at the way he has maintained the Michigan Central Railway State during his ownership. This is non an honest person. 1. Everyone knows that Joe Blog is a Moroun associate so his claims may be taken with a large grain of salt. .2. The claims in Moroun's ads and the claims made by the Morounistas have been graded by the Truth Squad as flagrantly foul. 3. Moroun is spending multi-millions in opposition to the NITC Bridge because he wants to keep his bridge tolls, duty-free profits and tax-free fuel sale profits. No sin in a man's wanting to protect his business. But if there's that much money involved, shouldn't the State of Michigan be entitled to have its own bridge to share in much-needed income to the State of Michigan. Either those profits are in the billions so that it's worth it to Moroun to spend millions in trying to keep them, or else he has long since surpassed the profits in the millions he has spent fighting the NITC bridge. If the latter is the case, then it's all a big game to Moroun and he can't stand to lose a battle, even if it costs him millions: He who dies with the most toys wins. 4. 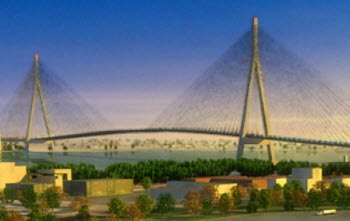 Moroun's ads claim -- falsely -- that the new bridge will cost U.S. taxpayers money. Not true. However, in all the fracas, we have lost sight of the fact that even if the new bridge were to cost taxpayers money, it would be an investment that would eventually pay off handsomely, to the benefit of our children and future generations of Michiganders. And even if it didn't, in this age of extreme terrorism threats, wouldn't the security aspects of a second bridge be worth the expenditure? Michigan needs the NITC Bridge, for many reasons. The NITC Bridge would not drive Moroun out of business; he would still be one of the world's richest men. But his current actions bear out the adage: The thirst for riches is infinite. Mr. Moroun should remember what Jesus told the multitudes: "Lay not up for yourselves treasures upon earth, where moth and rust doth corrupt. . .But lay up for yourselves treasures in heaven, where neither moth nor rust doth corrupt." Mr. Moroun's bridge is rusting and his actions are corrupt. We should pray for his soul. The fact that Maroun has poured millions of dollars into getting this proposal passed and ONLY HE stands to really get the benefit from it, should tell everyone they should vote AGAINST this proposal. This guy has made billions off this bridge and it is old and in need of a lot of repair., so he obviously took the money for himself instead of investing it back into keeping up the bridge. He has made enough money off this crossing. Time for the State to take over.